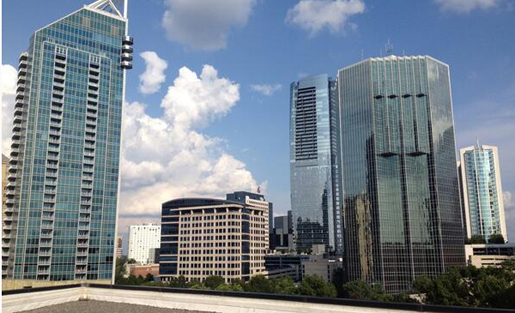 View from the roof of Atlanta Tech Village, where Collab/Space will take place on October 16. Photo by James W. Hill on Twitter, and used with permission. Ever since our successful Collab/Space workshop in Berkeley last year, we’ve been thinking about how to make our collaborative workshop format even better. This year, Collab/Space will be in Atlanta at the startup haven Atlanta Tech Village in Buckhead, and will take place on October 16, the day before ONA13. While we will still be helping journalists, technologists, designers, media makers, marketers and others work better together, we’ll be focusing on media startups and innovation this time. The workshop is sponsored by two groups that are pushing toward innovation and collaboration, the John S. Knight Fellowships at Stanford and the Center for Collaborative Journalism at nearby Mercer University. And we’ll have collaboration/improv guru Dan Grech leading us in fantastic collaborative exercises. We’ve chosen 9 great startups to present and workshop their projects (see the whole list below), but unlike many “pitch competitions,” the idea behind Collab/Space is to actually help each other succeed. We carefully chose startups for their diversity of ideas, diversity of stages they are in (idea stage to live services), diversity of geography, and diversity of leadership. Four out of the nine startups are led by women, and our mixer after the workshop will be co-hosted by the local StartupChicks chapter. There are still spots available, so please register today to join us at the workshop! Or if you can only make it to the mixer, please RSVP here. Without further ado, here are the presenting startups in alphabetical order. Description: With AdGlue, advertisers can choose how to place their ads next to relevant local content. The ad stays glued to that space for 30 days. Advertisers create their content on the publisher’s site and can change their ad at any time. AdGlue’s next phase will include the launch of Plus Predict, a web analytics platform to make buying more effective. Leader bio: Ben Ilfeld serves as a Society of New Communications Research Fellow. He created the first independent online local ad network. In addition to AdGlue, Ilfeld also founded The Sacramento Press, an online-only news outlet featuring primarily volunteer community contributors. He was a founding board member of the Local Independent Online News publishers. Ilfeld also enjoys winter sports and created Lift Camp, a skiing and snowboarding event. Description: Carolina Public Press, a non-profit online news service, provides Western North Carolina with public interest investigative reporting. It regularly offers educational opportunities to journalists and students on topics such as understanding and using state and federal public records laws. A team of professional editors, reporters and photographers produce Carolina Public Press. North Carolina print, online, broadcast and radio media outlets have shared the work of Carolina Public Press. Leader bios: Angie Newsome (left), a North Carolina native, founded Carolina Public Press in March 2011. She served as a reporting and writing fellow at the Poynter Institute after earning a master’s degree in journalism from UNC-Chapel Hill. Newsome has worked as a freelance reporter, editor and project manager for a variety of publications and organizations. She’s won awards for her reporting on the international banking interests of a North Carolina congressman and for following the closure of the nation’s last Levis sewing plant. The McCormick Foundation named Newsome one of four New Media Women Entrepreneurs in 2012. Jon Elliston (right) writes from Asheville, N.C. He formerly worked as managing editor of Mountain Xpress, an alternative newsweekly. His forthcoming book, supported by a research fellowship from the John F. Kennedy Presidential Library Foundation, tells the story of an integrated summer camp in Western North Carolina that a local mob attacked before running it out of the state in 1963. Elliston has also written about history, culture and politics for The Nation, Popular Communications, U.S. News & World Report and WNC Magazine among other publications. Clear Health Costs has a mission of explaining what things cost in health care. The site gives a range of costs for various health care services and products. It uses information from old-fashioned reporting, crowdsourcing and price databases to display in interactive data visualizations. Clear Health Costs launched with a grant of $54,000 from the Tow-Knight Foundation at the City University of New York Graduate School of Journalism, the International Women’s Media Foundation and the McCormick Foundation’s New Media Women’s Entrepreneurs program via J-Lab: The Institute for Interactive Journalism. Jeanne Pinder founded Clear Health Costs after volunteering for a buyout from The New York Times in 2009. Pinder worked for the Times for 25 years as a reporter, editor and an executive. Previously, Pinder also worked for The Des Moines Register, The Associated Press and The Grinnell (Iowa) Herald-Register. At Grinnell College and Indiana University, Pinder studied Russian and Slavic linguistics and used to live in the former Soviet Union. Description: FlashIssue works as an email marketing tool. It works inside Gmail to allow users to easily design their own emails, build mailing lists and track performance. FlashIssue also features a browser plugin to help businesses locate relevant content from their own blog posts or other publications’ articles that they can add to their newsletters. Leader bio: Phil Hill calls himself a serial technology entrepreneur. Before starting FlashIssue.com, he founded a file management company called Netzip.com, which RealNetworks acquired for $267 million, and a VoIP phone service called Vocalocity, which has an annual revenue of $65 million. When he’s not working, Phil works with a start-up accelerator he created for disadvantaged entrepreneurs called Foundermachine.org. He also used to chair Soccer in the Streets, a nonprofit for inner city kids. Description: Groundsource is a mobile communication platform where journalists, researchers and other professionals can engage people with simple phones. Users can recruit sources with text messages, phone or mobile web, then target questions or news bulletins at them based on demographics, geography or other criteria. The aim is to allow users to quickly make contact with a select group of people and gather context for stories and decision-making. Leader bio: In addition to founding Groundsource, Andrew Haeg serves as an Entrepreneur in Residence at the Center for Collaborative Journalism at Mercer University. Haeg spent a year as a Knight Fellow at Stanford University and has more than 15 years of experience as a journalist. He works with American Public Media where he co-founded the Public Insight Network, a crowdsourcing platform with more than 200,000 sources used by close to 100 newsrooms. Description: Meograph is a multimedia creation platform that helps companies engage their customers in storytelling, embedded in their own site. This intersection of user engagement and content marketing generates highly monetizable loyalty, traffic, and content. Engaging customers in multimedia creation builds loyalty, better traffic, and promotes authentic brand message. But it’s hard to regularly build UGC campaigns, and creating rich content is too hard for most people. Meograph is a platform that embeds in a customer’s page to let them engage their customers in multimedia creation. One line of code to implement a branded, native experience. Leader bio: Misha Leybovich, the CEO of Meograph, has visited over 70 countries and worked on four continents. He earned his master’s degree in aerospace engineering and technology and policy from MIT and also did research at the Judge Business School at Cambridge University. Before starting Meograph, Leybovich served as a consultant with McKinsey & Company, which advises businesses, governments and institutions on solving senior management issues. Description: The San Francisco Public Press is developing a new model for independent accountability reporting. Our vision is a sustainable local venture that reinvents the newspaper as a community-supported public trust. Our collaborative approach seeks to avoid reinventing the wheel by extending the reach of more than two-dozen local non-profit news organizations by sharing resources and convening ambitious team reporting projects. Through our daily news website and quarterly print edition, we focus on issues of great concern to the Bay Area that traditional media companies ignored. This new approach requires a new funding model for media. Avoiding the potential conflicts of interest that results from relying on advertising revenue, the Public Press depends on a core group of 800 individual supporter members, a dozen foundations and a small but growing cadre of private philanthropists who believe what we do is essential to the community. This approach can be adopted in other communities around the country. Leader bio: Michael Stoll is executive director of the SF Public Press. He has been a reporter at the Hartford Courant, the Philadelphia Inquirer and the San Francisco Examiner, and written freelance for Columbia Journalism Review, Earth Island Journal, SF Weekly, the San Francisco Bay Guardian, Quill, the Christian Science Monitor and the New York Times. Description: Social News Desk works as a social media management system to help journalists follow best practices and work better as a team across several social media platforms. The system features tools to track which staff member posts what, secure valuable social accounts and compile analytics. Social News Desk provides an app for social media monetization and works with The Weather Channel Companies as their exclusive social media partner. More than 250 newsrooms nationwide use Social News Desk. Leader bios: Kim Wilson (right) worked in television news for 10 years before starting Social News Desk. She graduated from the University of Florida and once worked as an assistant to Dan Rather on CBS News. She also contributes to several social media websites like Mashable.com. She has served as a member of the University of Florida’s Advisory Council to the College of Journalism since 2004 and regularly teaches in the University’s Telecommunications Department as an Adjunct Lecturer. Elisa DeFoe (left) co-founded Social News Desk. She has served as an executive producer at several television stations in Florida. She graduated with degrees in mass communication and business from Florida State University. DeFoe also owns Dance Trance Fitness in Orlando, Fla. Description: Voices on the Record uses audio to create a collaborative web space for Latin American topics. Users will post interviews, testimonies or news reporting recorded by journalists and citizen journalists in Spanish. Because journalists often quote only a portion of their recorded interviews in their finished pieces, Voices on the Record would serve as a place to post the full raw audio for interested parties to hear. Leader bio: Ana María Carrano serves as a Knight Fellow at Stanford University. She’s a journalist from Venezuela and has worked for several years as a book editor. Carrano has focused on digital journalism since 2009 when she joined Cadena Capriles, a publishing company that owns three newspapers. She coordinated the first apps for iOS and Android tablets developed by a Venezualen newspaper and created Tuzonacaracas.com, the first collaborative, hyper-local website in Venezuela. MediaShift editorial intern Paige Cooperstein helped compile this post.